The dream of many software developers is to create their own business, so they can work for themselves all the time instead of working for others. So they start thinking of ideas for new software products, but they are never certain of which ideas will be successful. So they often pick one idea they like and then start working it. After many months they launch it but often the product does not have the traction they hoped. This is what is called the shot in the dark. The dream turns into a frustration. I have found myself in this situation many times, so I thought to myself that there should be a way to avoid the frustration. Fortunately this does not have to be this way. There are methods to evaluate your ideas even before you start working on the products, but most developers are not aware of them. 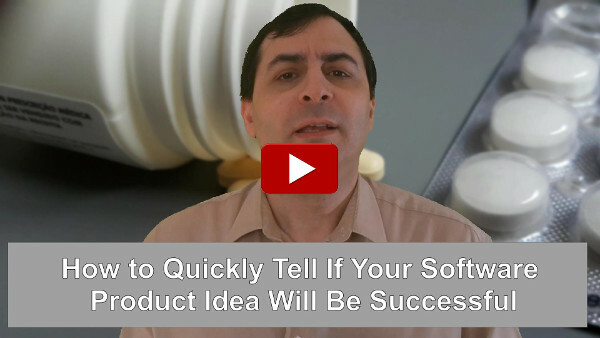 Therefore I created this short video below to tell you about about one of the simplest methods to evaluate your ideas for software products. It is not the only method that you should use but it is a good start. Not only it will help you to figure what ideas have more potential, but it can also be a tool to help you have better ideas, so you can become more confident that your software product will be successful. Maybe your initial ideas are not so bad, but you may need to rethink them so they can really meet the real needs of paying customers. That is what this short video below is about. In this video not only you can learn about sorting your ideas, but you can also learn about a free workshop that will be announced soon, so you can learn about these and other essential matters regarding establishing as a successful software business company. Make sure you signup (on the video page, not on YouTube) to be notified when the workshop is launched, as well when new follow-up videos are published.